R.I.P. liquidity! While I did enter at a top, it seems like Cable has very little room to fall. What does this mean for my trade? You got it, I have to close early. Besides, there seems to a be a rising channel forming too. Still, I’m happy I got a win. I could have gotten more if I closed early, but that would mean my profits would get cut if price continued to go my way. Gotta let your profits ride, right? All in all, I believe it was a good trade. My entry for this trade will be the 61.8% Fibonacci retracement level. As you can see, it nicely coincides with the falling trend line. Stochastic isn’t at oversold territory yet, so I think price could still climb up to my desired entry level. I’m going set my limit order at 1.5840, close to the trend line and the 61.8% Fib. 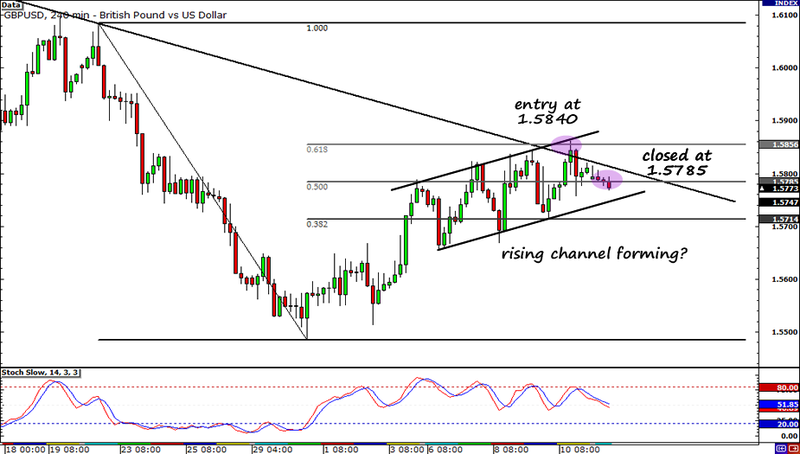 Once triggered, I will set my profit target at 1.5550 just near the previous low. I will place my stop loss at 1.5950, which is above the Fib and the falling trend line. Smart, huh? Hah! Now let’s take a look what the forex economic calendar offers us. First up, there’s the BOE’s interest rate decision later on. The market is expecting the BOE to keep rates unchanged and reiterate their point that inflation will probably tone down in 2011. This, to me, is very bearish, as it indicates that we won’t be seeing any interest rate any time soon from the BOE. Then, during the U.S. trading session, the initial jobless claims will be released. Claims are expected to fall to 425,000 from 436,000 last week… Hmm, I don’t know about that! Just last week, the NFP report came in so much worse than expected. So I have sufficient reason to believe that the report later MAY also miss expectations. With risk sentiment being the current focus of the market, worse-than-expected results on the report could trigger another round of risk aversion! That’s a GOOD thing for the dollar (and for my account of course)! 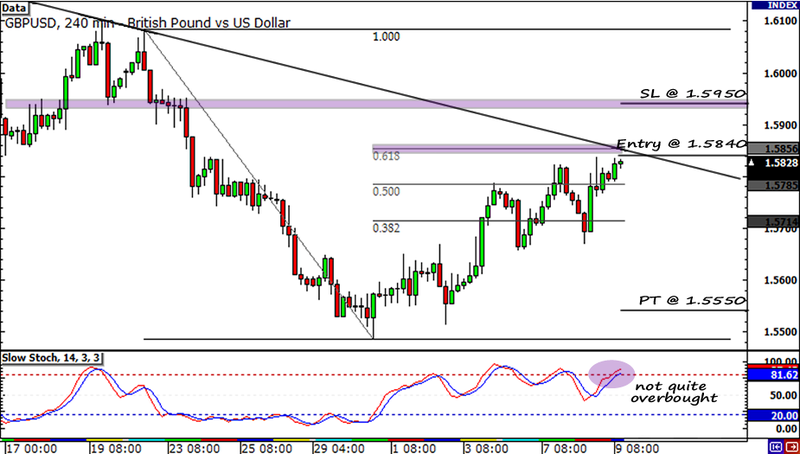 Short GBP/USD 1.5840, pt at 1.5550, sl, 1.5950. I will risk 1% of my account. I’m going to get this right? Right? RIGHT?!? I guess I’ll just have to wait and see!